Happy Wednesday crafty friends! I hope you are all well and having a good week so far. It’s half-term here so it’s nice to be out of the school routine for a week. They have still been given homework, though most of it was done at the weekend. Even I’ve got some homework – to make a toga for Finley as they will be learning about Ancient Greece when they go back! The thing is, I know I have one somewhere that I have made for school before but I just can’t find it 😦 Never mind, I’ll come up with something!! This image always gets me singing that wonderful Christmas tune…not long to go now for the big day! Why not pop on over to the FTHS blog to see what our fab designers have created for you today and do stop by the shop as there has been some sweet new images added in the past few days. 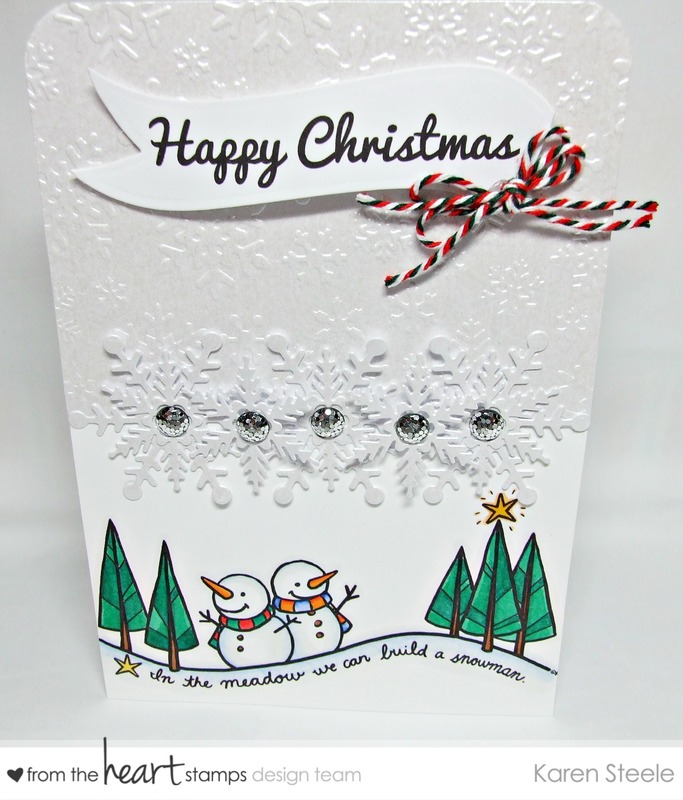 I also used snowflakes dies from Waltzingmouse Stamps and Marianne Dies, X-cut snowflake embossing folder, Centura Pearl card, Papermania Shimmer Domes and twine, banner die from Spellbinders and Spectrum Noirs to colour. Super cute! Love the snowmen! Oh, what a pretty Christmas card with darling scene! Love the embossing, snowflakes, and twine bow! Oooh pretty – I love embossing on card fronts – it allows for clean and simple but not just plain white – great touch! So pretty! Love the snowflakes and the little snowmen! What a beautiful design! Fantastic job showcasing this sweet image. Karen, this is so sweet! 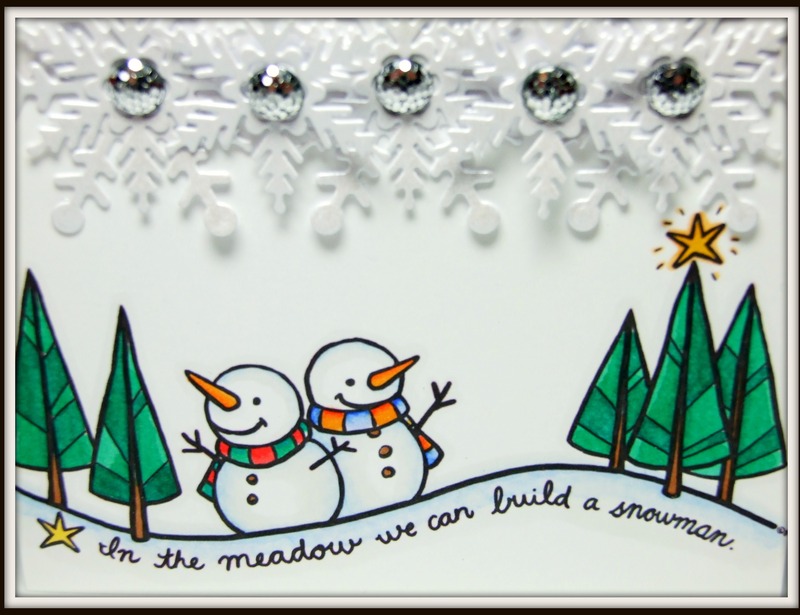 I love the embossed background and those gorgeous snowflakes! Great card! Karen, this is my favorite 100 Snowmen image and this card has made me love it even more! Wonderful! So cute. I like the snowflakes and the bling. I bought this one too.